When powered on, the modules report themselves as “AEGIN” and default to Slave Mode with a baud rate of 9600. The process for using them in Slave Mode, connecting to the Arduino and talking to an Android device, is the same as other modules. Like other HC-05s and HC-06s the boards have a voltage regular on the vcc pin and accept a voltage in of 3.6v to 6V, however, the other pins are 3.3v only. This means you can power the boards from a 5V rail using the vcc in but you should not connect the others pins directly to 5V. I assumed these were like other HC-05s I had but could not find how to get in to AT mode. By accident I reset the module while the serial monitor was open and received a start up message. 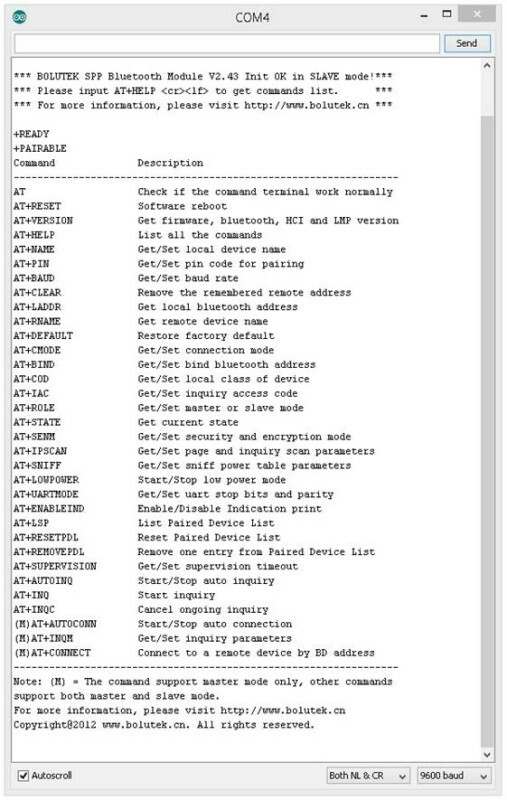 This shows the manufactures website, that the modules are in Slave Mode and that they have a “AT+HELP” command. A quick “AT+HELP” later I had a list of the AT commands. This means the modules do not have a separate AT mode like other HC-05s. On start up they are in Slave Mode and accepting commands. After a connection is made the modules go in to communication mode and AT commands no longer work. In communication mode anything the module receives is treated as data and sent to the connected device. The HC-06s use the same breakout board as the HC-05s but have some differences. When the EN pin is pulled LOW (connected to ground) the modules are disabled. The STATE pin on the breakout boards connects to pin 25 and pin 32 on the small Bluetooth module. On the FC-114 pin 32 in a normal IO pin and pin 25 is MCU_INT. On the boards I received pin 25 was not connected to the breakout board and so the STATE pin was not connected. After connecting pin 25 to the breakout board the STATE pin works as expected; LOW when not connected and HIGH when connected. Tt appears that the HC-06 FC-114s have the same firmware as the HC-05 FC-114s. 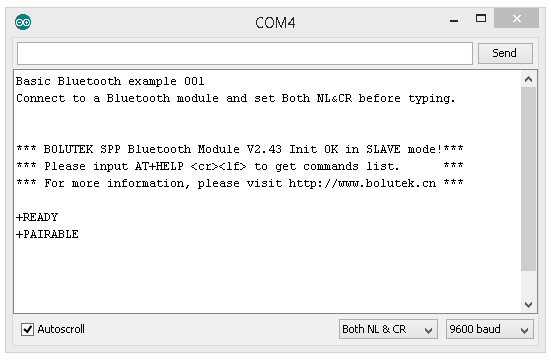 “AT+HELP” gives the same list of AT commands and “AT+VERSION” reports the same firmware version: “+BOLUTEK Firmware V2.43, Bluetooth V2.0, HCI V2.1, HCI Rev37, LMP V4, LMP SubV37″ and should mean that HC-06s can be used as Master devices. The manufacturers website gave me the model number of the Bluetooth modules. A visit to http://www.bolutek.cn shows that the Bluetooth daughter boards are model BLK-MD-BC04-B. One thing to note is the power consumption; 3.3v at 50mA. I do not know if 50mA is constant or if it is the maximum the board can draw (likely it is the maximum) and this too much for a regular Arduino pin to supply so the modules should not be connected to a regular Arduino pin. They can safely be powered from the Arduinos 5V out but it is worth remembering that the 5V pin on can only supply up to to 200mA so if you are adding other devices/sensors you may need to be careful of the total current. Once I had the model number it was fairly easy to get more information online and means these are not new modules, just new to me. It may be that they have not been put on to these breakout boards before though. Although the small modules look the same as the ones used in other HC-05s and HC-06s the Bolutek firmware uses different pins. – Pin 24 is for a status LED. This is connected to the LED on the breakout board. – Pin 26 is reset. This is not connected. – Pin 27 is used to determine if Master Mode can be selected in software or Hardware. – Pin 28 is used to select Master or Slave through hardware. If pin 27 is HIGH then we can set Master Mode in software. If pin 27 is LOW then we need to use hardware (pin 28) to select Master Mode. When pin 27 is LOW (or not connected) pin 28 is used to selected either Slave Mode or Master Mode. – Pin 27 LOW + pin 28 LOW = Slave Mode. – Pin 27 LOW + pin 28 HIGH = Master Mode. On the modules I have, pin 27 and pin 28 are not connected. This means, at least at the moment, I cannot set the modules to Master Mode in software. Trying to change to Master Mode using “AT+ROLE1″ gives me an OK but it does not seem to actual put the modules in to Master Mode. However, it is early days and I haven’t really experimented with these modules yet. I need to research this further but it it likely that if I want to use these modules in Master Mode I will need to solder wires to pins 27 and 28. Hi, need your help. Is it possible to us FC-114 with HM-10 module ? The HM-10 modules are Bluetooth V4 only and so cannot connect to the FC-144 modules. Hi, I have FC-114 HC-06 module, but I can not put it in AT MODE, the LED module is always blinking fast. How do I get it? I’m using an arduino UNO. Please let me know if you need some other clues. HC-06s are in At mode by default, however, you may not have the Bolutek firmware. Using the set up / connections from http://www.martyncurrey.com/hc-05-fc-114-and-hc-06-fc-114-part-2-basic-at-commands/ do you get the welcome message when you cycle the power to the HC-06? Does AT+HELP give you a list of commands? If no to both questions you likely have a different firmware. Have a look at http://www.martyncurrey.com/arduino-and-hc-06-zs-040/. Try different baud rates and different line end settings. If 1 & 2 do not work try 38400. Hi, My new HC-06 doesn’t even blink in my Arduino Mega2560. My question is : does the Rx needs exactly 3.3 V to work ? because i have only a 1.8 ohm resistor ? When the LED Blink ? The LED should blink as soon as you apply power. 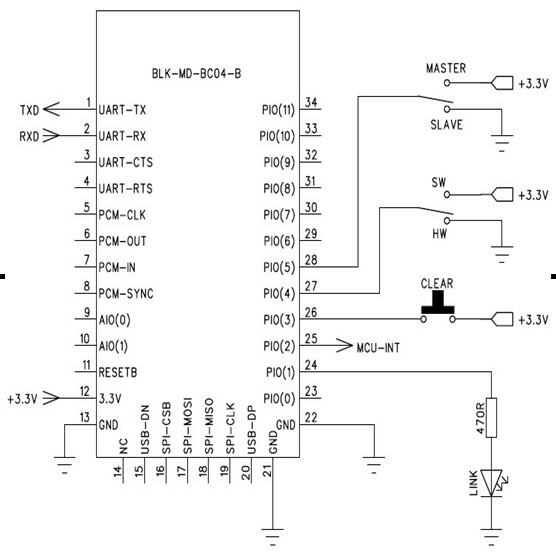 Are you using 5V connected to the vcc pin on the breakout board? It appears not all FC-114 boards use the same firmware and you may have different LED blinks/status. You need to try and confirm which firmware you have. Use the set up from http://www.martyncurrey.com/hc-05-fc-114-and-hc-06-fc-114-part-2-basic-at-commands/. While connected to the Arduino and with the serial monitor open, cycle the power to the HC-06 and see what welcome message you get. With a 1.8K resistor instead of a 2K resistor you will you have 3.2V (if I have done the calc correctly) instead of 3.3v. This should be fine. I tried it but to use. Every time i enter “AT”, it echoed “Qõ/ÿ”. i really need your help with hc-05 fc-114 i don’t have wires to set pin 27 and 28 directly(hawdware method) can you help me with a software solution to configure my hc-05 fc-114 to AT mode ?? The modules I have are already in AT mode. Do you mean Master Mode? 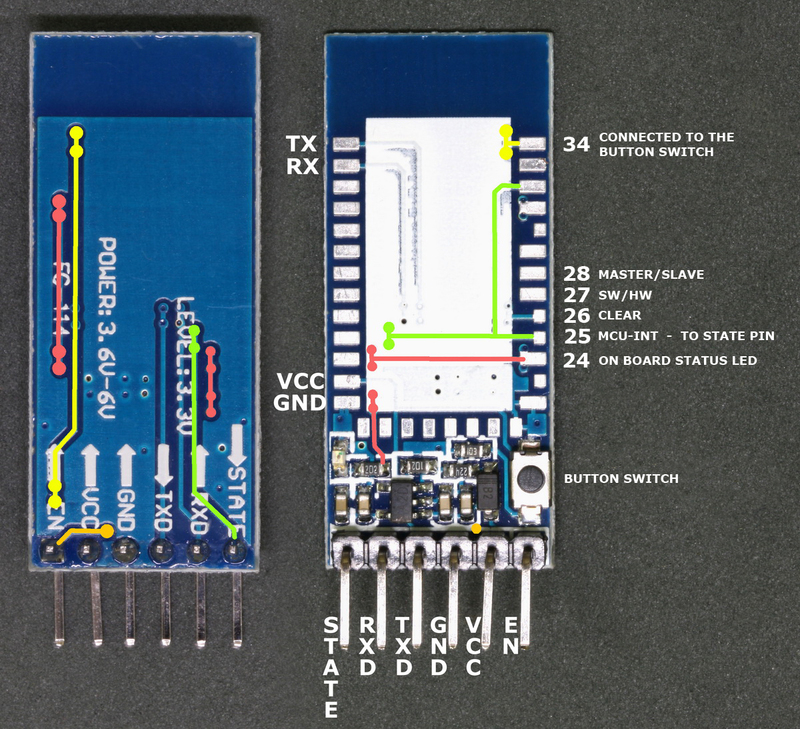 The modules need a connection to pin 27 or pin 28 to enter Master Mode. Hi. Great information, thanks for sharing. I have HC06-114 labeled ZS-040. I can send AT commands from PC Serial Monitor and have all responses opk. I can chnage NAME and i see versión. But i can not connect from the Android. I can see the Arduino from the APP but never connects. Say the PIN is incorrect. If i check AT+PIN, the result is PIN=000000 (6 numbers). I can change for other 6 different numbers, but maybe the reason for can not connect be that. 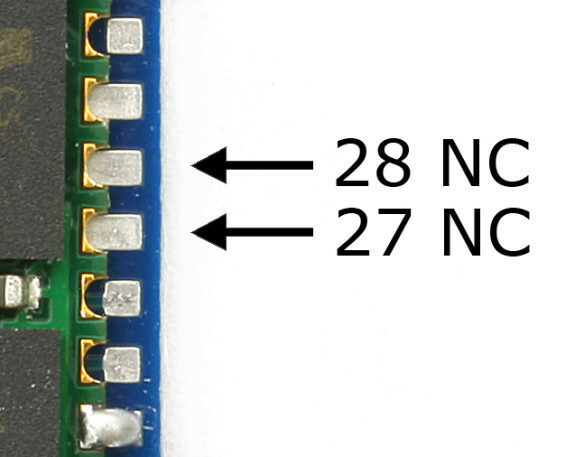 Unfortunately there are now many different Bluetooth modules that use the same zs-040 breakout board and if the PIN is 6 digits then it is using a different firmware to the ones above. What firmware version do you have? It looks like you have the AT-09/HM10 BLE device. I’m using a PIC microcontroller and able to communicate with a USB to RS-232 to the PC using putty. Then when I switch to the FC-114, no communication at all. So, upon start up the FC-114 is in AT mode? Question: Does communication mode mean pairing established? I’m able to establish pairing, but no communication from microcontroller. Is the FC-114 in AT mode or communication mode after pairing? After pairing the device is still in AT mode and you then need to start communication. Have a look at http://www.martyncurrey.com/hc-05-fc-114-and-hc-06-fc-114-part-3-master-mode-and-auto-connect/ for a basic way to connect 2 modules. You can also follow the examples in the http://www.martyncurrey.com/arduino-and-hc-06-zs-040/ post to talk to an Android device. I’ve updated the link. Didn’t realize the .com website link was broken. It looks like they have revamped their main site. what shall i do pls!!! Hello Martyn, It seems like i have an HC-06 FC-144, as this is what is written on the Module and it also shows up as HC-06 on my Computer when i go to Bluetooth settings. I was trying to get it into AT mode, because i have to change the baud rate to 115200 because i need it to communicate MIDI messages to my Computer. No mentioned Method worked for me getting it to respond to AT Commands, i didn´t even get it to say ok to a simple AT. I wired it on my arduino Mega, with VCC to 5V, GND to GND, RX over Voltage divider (1K, 2K) to TX on Arduino, and Tx to RX. I paired with it before with my computer just to see if that worked, and now i can´t even pair with it anymore. its just blinking along and doesn´t respond to anything i´m doing. I´m really desperate cause i spend days trying to figure out what I can do to change its baud rate… i hope you can help. Thanks a lot.